The College of Medical Laboratory Technologists of Ontario (CMLTO) serves the public interest by investigating complaints regarding medical laboratory technologists (MLTs). 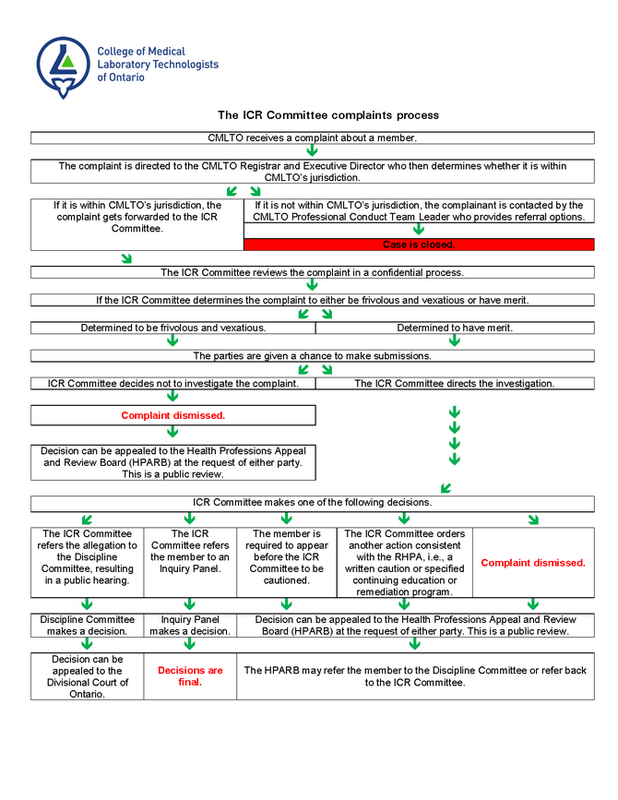 Following a thorough investigation, the Inquiries, Complaints, & Reports Committee (ICRC) has the authority to conclude complaints with reminders and or recommendations, issue cautions, and refer specified allegations of a member’s professional misconduct or incompetence to the Discipline Committee for a hearing. The ICRC can also require a member to complete a specified continuing education or remediation program. An MLT who is found, by a panel of the Discipline Committee, to have committed an act of professional misconduct or to be incompetent may face fines, suspension and/or revocation of his or her right to practice. The CMLTO publishes the results of all discipline hearings in its quarterly publication FOCUS, which is available on the CMLTO website. What if someone makes a complaint against me? If someone wants to complain about an MLT, his/her complaint must be put in writing or other recorded format and submitted to the CMLTO. Complaints are dealt with by the ICR Committee in accordance with the procedure set out in the RHPA. You will receive a copy of the complaint or a summary and be asked to respond within 30 days. This is your opportunity to provide the Committee with your understanding of the events in question. Please provide the Committee with an honest and detailed response including any information or documentation you feel will help the Committee understand what occurred. Keep in mind that your response will be sent to the complainant for his/her review and comment. Please note that failure to respond to the CMLTO is an act of professional misconduct. The ICR Committee will conduct an investigation which may include interviewing you or other colleagues, patients or others who may have information that will assist the Committee. After the investigation is complete, the Committee reviews all of the information and renders their decision. You and the complainant will each be provided with a copy of the decision and reasons. Unless the matter has been referred to the Discipline or an Inquiry Panel to assess the member's fitness to practise,, you have a right to ask for a review of the decision by the HPARB. Requests for reviews must be made within 30 days of receipt of the Committee’s decision. The ICR Committee is made of public and professional members, the majority of whom are MLTs. Since a complaint may have serious implications for you, you may wish to seek legal advice in preparing your response. Members of CMLTO staff are required to remain neutral and objective throughout the process and are there to answer your questions and provide guidance. Once a complaint has been filed, it is best not to contact the complainant directly but to allow the matter to be dealt with through the complaints process. By promptly responding to the complaint and providing the CMLTO all relevant documentation you not only assist the Committee in their investigation, but also will avoid unnecessary delays in resolving the matter.